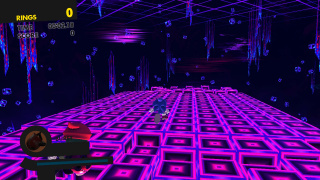 Null Space is the twentieth stage of Sonic Forces and the third Tag Team stage where the player controls Modern Sonic and the Avatar simultaneously. The beginning of this stage is located in a supposedly-inescapable pocket dimension created by the Phantom Ruby where nothing exists, but it only lasts a very short while as Sonic and the Avatar immediately use a Double Boost to escape and return to Metropolis for the rest of the stage. Having been trapped in Null Space by Infinite, Sonic and the Avatar decide to break out. Using the Double Boost, the two of them are able to force they way out of Null Space and return to an under-siege Metropolis, surprising Knuckles over the radio with their sudden reappearance and allowing them to continue their hunt for Dr. Eggman. While Sonic and the Avatar make their way through the city, Amy gives them an update on the battle in Metropolis, reporting that the Resistance's fleet has gained the upper hand and that they should have everything under control if all goes well, while Rouge herself urges Sonic to hurry, as he is missing all the fun. The two heroes eventually track down Eggman and his henchmen, surprising the doctor on how they were able to escape the inescapable Null Space. Regardless, he refuses to give up just yet, and warns the blue blur that he will have the last laugh before retreating in the Egg Mobile, with his henchmen following him. Null Space takes place entirely in 3D. The level opens with Sonic and the Avatar running through the pocket dimension, but as stated above, they spend a very short time here as the player is prompted to use the Double Boost to escape. The rest of the stage has the player grind across rails and hop from building to building, taking out waves of enemies with the Wispon to make a spring or pulley appear and advance through the level. It is ideal to bring a Wispon capable of destroying entire circles of enemies very quickly, such as a Burst Wispon.